Geotextiles are manufactured fiber materials made into a variety of fabric constructions, and used in a variety civil engineering applications. Geotextile fabrics are manufactured in a woven and a nonwoven material. Each has its own unique applications and benefits. In general, woven fabrics exhibit high tensile, high modulus and low elongation and nonwovens exhibit lower tensile, higher elongation and higher flow rates. 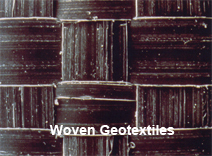 Several yarn types are used in varying weaving patterns for geotextiles fabrics. A multifilament yarn consists of many fine continuous filaments that are held together by twisting or intermingling the strands. A monofilament is a single strand. A slit film yarn is a flat, tape-like strand produced by slitting an extruded polymeric film. Fibrillated tapes are made by splitting and twisting extruded films. 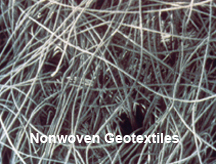 Nonwoven fabrics are produced by fiber formation and results in either a continuous filament or a staple fiber. Fibers are then bonded by needle punching, heated calender or other processes or combinations. 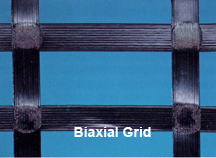 Geogrids are characterized by their large opening size. 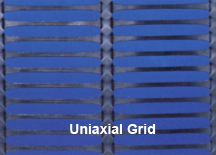 Some geogrids are made from punched sheets that are drawn to align the polymer molecules. Other geogrid constructions are formed by welding together oriented strands or by weaving or knitting yarns and coating them to form a grid configuration.